Here's our summary of key events overnight that affect New Zealand, with news we have been searching for some positives in these dark days and may have found some. New Zealand (unchanged) has overnight been ranked the eighth happiest place on earth, the highest ranked non-European country. Canada was ninth, Australia 11th (down one place), the UK 15th and the US 19th. There are 156 countries and territories in this list. China is 93rd although Taiwan is 25th. Also happier is Wall Street which is up strongly in afternoon trade today, buoyed by the US Fed's dovish turn. The S&P500 is up +1.1% so far, taking the overall 2019 rise to +14%. This follows overnight changes in Europe that were lackluster, and mixed changes in Asia yesterday. Generally, equity investors repriced higher after the US central bank signal change. Bond investors did too, driving down the yields of fixed income benchmarks. But the latest signals from American consumers show rising concerns about their economic direction. And a regional Fed survey wasn't overly positive either. On the trade front, the US Agriculture secretary has noted overnight that China is hardening its positions in the trade talks. These talks will no doubt drag out. Key US negotiators are going to Beijing next week trying to find an agreement. Also dragging out is the Brexit negotiations. The EU has offered the UK US a 60 day extension for negotiations - on the proviso that the UK Parliament vote next week for the only deal on the table. Meanwhile the EU is pushing ahead with 'no-deal' contingencies. In Europe, Spain has released some positive growth numbers, a bright spot in Europe that overall feels like the wind is going from its sails. In Australia yesterday, data released shows their jobless rate dipped to 4.9% in February, its lowest level in more than seven years. It is data that has some rough bits, but all the same it was better than expected. The UST 10yr yield is down another -2 bps at 2.52%. Their 2-10 curve is lower at +12 bps and their negative 1-5 curve is wider at -15 bps. The Aussie Govt 10yr is down another sharp -6 bp to 1.86%, the China Govt 10yr is little-changed at 3.16%, while the NZ Govt 10 yr is also down sharply, by -5 bps to 2.03% and a new record low. Gold is down -US$9 to US$1,306. US oil prices are little-changed today at just on US$60/bbl while the Brent benchmark is just on US$68/bbl. The Kiwi dollar has given up yesterday's gain and is now at 68.7 USc. On the cross rates we are at 96.7 AUc. Against the euro we are still at 60.5 euro cents. That has the TWI-5 at 73.2. Bitcoin is down -1% on the day, now at US$3,955. This rate is charted in the exchange rate set below. Finally, you should note that this service will go off-line today at 1:30pm to mark the two minutes of silence to respect the victims of the Christchurch tragedy. "The EU has offered the US a 60 day extension for negotiations"
woops. Fixed now. Thanks for heads up. 10 year NZ bond yield goes sub 2.00. Fed now on hold, all time low's in the term NZ yield curve - both will support asset prices. If i was sitting on the sidelines of the housing market, these are the things that would concern me. It's very telling that the happiest places tend to be social democratic nations, or a variant of. Auckland trademe listings climbing on a Friday which is unusual. We are at 14,250. We might get to the magic 15,000 on realestate.co.nz. That is at 14,562. Does anyone have any end of March figures for trademe for previous years. 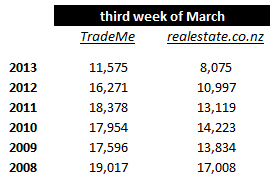 Interesting how realestate.co.nz seems to have overtaken TradeMe in the last few years. as of a few hours ago. Those trademe numbers really pop my bubble (pun intended). There was only 17 on the schedule as of last night, and one of those was withdrawn? where did the other 3/4 come from? How many passed in for negotiation?